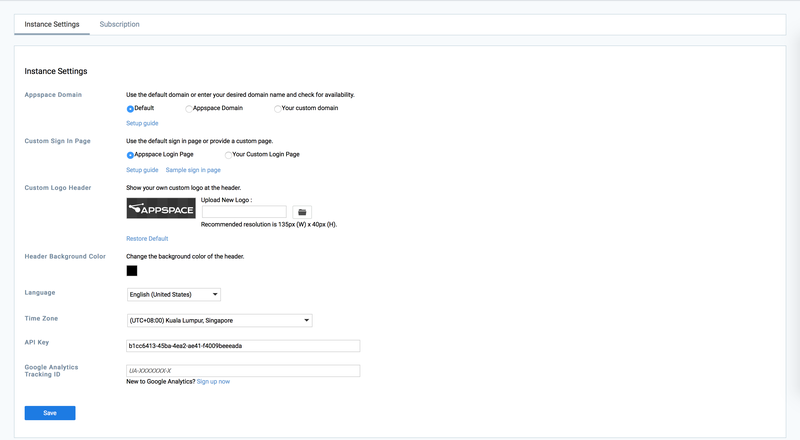 This article provides the instructions to configure the theme settings when viewing channels in the Appspace App or Appspace Web App. Navigate to Admin > App Configuration from the ☰ Appspace Menu navigation bar, and click the App Theme tab. In the Theme Selection section, select Light or Dark for the Web Client and TV themes. Alternatively, the Web Client theme settings can be changed by clicking the User Profile button, and selecting Change Theme. The theme switches between light and dark. Click the Logo image, and click the browse button. Upload an image, or select an image from the Library, and click Apply. Click the Accent Color color picker. Navigate to Channels from the ☰ Appspace Menu navigation bar, and click the Channels tab. Create a playlist, and name it interactive-theme-background. Next, click the Publish tab, and publish the playlist to the device. Appspace App will then display the customized theme background. If there are multiple interactive-theme-background playlist published to the device, Appspace App will only display content from the last playlist added.